We know what it takes to be business-ready at all times. It’s the everyday essentials that keeps your organistation running smoothly and efficiently so we have brought together a complete range of products that lets you get on with doing what you do best. We offer a wide range of cartons to get your products to your customers in excellent condition. 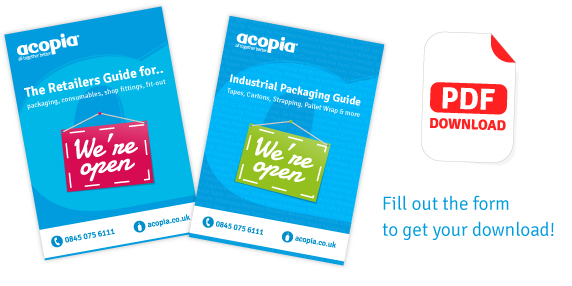 Talk to us about personalising your packaging to strengthen your brand! Make sure your deliveries don’t get damaged with our wide range of protective solutions. Talk to us about a bespoke solution for those tricky products! There’s nothing like receiving a parcel in the post is there? Give your customers the best experience with our variety of packaging solutions or talk to us for different bespoke designs for a bit of WOW! From your warehouse to the H&S Office we’ve got you covered. We keep your operation moving with warehouse sundries, signage, workwear, cleaning supplies as well as first aid essentials. For retailers, manufacturers, wholesalers and all in between we supply the whole spectrum of bags from luxury carriers to polythene bags for spare parts. Talk to us about making customers feel special with personalised bags! There’s something for everyone here – whether you’ve borrowed that stapler too many times or are running our of copier paper, our stores are lined with goods to keep your business at optimum performance. Whether you’re needing refreshments for elevenses or run a café, we can help you with catering consumables and equipment as well as tasty treats! With a wide and varied range of fully supplied and fitted projects completed, you can leave your shop to us, from the plastering to installing the shop-fittings. Talk to us today and find out why our clients tell us our fit-out projects deliver real returns on investment!. We touch every part of your customers’ experience with display accessories to show off your products to the bags and receipt they walk away with. Talk to us about your Visual Merchandising to grow your sales! We help you look after your most valuable asset, your plants, and keep them looking their best with irrigation solutions to great display accessories. Talk to us about bespoke solutions for your plants and products!